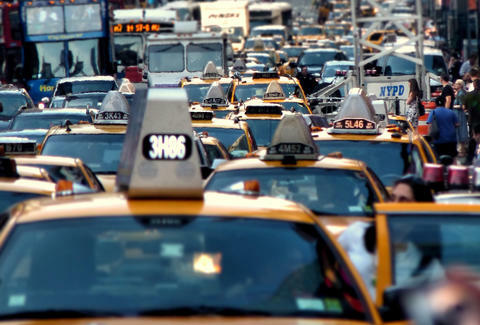 Which US City Has the Worst Traffic Congestion? Whether it's due to bad infrastructure, unending sprawl, or simple overpopulation, everyone loves to boast about how bad the traffic is in their city -- the simple fact that you can endure it is like a badge of honor, or something. But since every city can't have the absolute worst traffic in America, a new report has come out detailing exactly which places give motorists the worst experience/most bragging rights. Compiled by Texas A&M's Transportation Institute and road traffic data company INRIX, the 2015 Urban Mobility Scorecard examined the country's largest urban areas, ranking them by total hours of delay each year. Washington, DC wins the title of "Worst Congestion in America" with an average of 82 hours per commuter each year. The race was close-won, though, as Los Angeles took second place with 80 hours and San Francisco took third with 78 hours. In fact, four of the top 10 most congested cities were located in California. In addition to hours spent in gridlock, the report also looked at excess fuel burned per commuter, as well as the average congestion cost per commuter. DC came out on top in congestion cost with a whopping $1,834, although it actually tied with New York for excess fuel burnt per commuter (35gal) -- which makes sense, given the constant stop-and-go traffic throughout Manhattan.